HistoryPoints.org delivers Welsh history to your mobile, on the spot! Look out for our QR codes on windows, fences, doors, walls, gateposts and noticeboards at more than 1,400 places across Wales. Simply scan the codes with your smartphone or tablet to read a concise history of the object in front of you. See below for more about mobiles. Desktop/laptop users: You can browse the website on your desktop computer. Every featured location – which we call a HiPoint – is mapped, so it’s a doddle to find your way to interesting places after you’ve read about them. 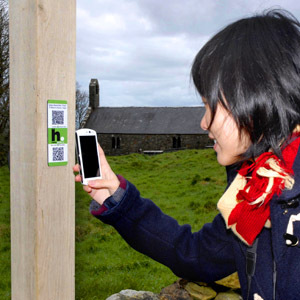 Take your mobile when you go, then use the QR codes to refresh your memory! To read about HiPoints on the website, choose a category in the black bar above. Then use the menu you’ll see on the left to choose a county, town or district, then you’ll see a list of the HiPoints in that area. Or use the Search box in the top right corner. You might like to browse the HiPoints along one of Wales’ long-distance routes, including the Wales Coast Path, the Offa’s Dyke Path and principal National Cycle Network routes. Use the icons at the foot of HiPoint pages to discover the next place on our tours. We’ve also created local walking tours in many towns. Read an introduction to the tours. Please use the Feedback form if you have any suggestions about other places to feature or comments, or to report missing or damaged QR codes at a particular HiPoint. Browse our Contributors’ section to discover where local history societies, museums and others are providing information to a new audience via mobiles and our QR codes and website. If your group would like to contribute, please get in touch via the Feedback form. Please patronise the businesses who sponsor some of our pages, if you can. Their sponsors’ banners are shown on the pages they sponsor. It’s their generosity which allows HistoryPoints.org to bring you all this fascinating, fun and free information about Wales! Information about most of our HiPoints is available in at least two languages, thanks to volunteer linguists. Look out for language icons in the top right of the screen if you’d prefer to read in Welsh, French, Japanese or other languages, where available. If you don’t already have a QR-code reader, search the net or your app store for a “QR scanner”. Once you’ve downloaded and installed it, point the device’s camera at the QR code to call up the text encrypted in the code. Each of our plaques and window stickers has two codes. The upper (or sometimes left) one contains a summary text which opens immediately in your phone – no internet connection needed. The other QR code should open a HistoryPoints.org web page on your screen. We keep the pages free of clutter and large images, but in some locations – especially in the countryside – you may need to be patient while your mobile downloads the page. If your phone can’t connect to the internet at the HiPoint, you can store the web page address in your phone and view the page later. HistoryPoints.org provides totally free information, but you might want to check whether your mobile contract includes data download charges or limits. Why not scan the QRs on the left to see – and hear – for yourself? © Copyright History Points (inc' contributors)2012-2019 Content must not be reproduced without written consent.